Blue Walking Bridge located in Canal Park in Duluth, MN and spanning the Minnesota Slip. 8″x9″ graphite on illustration board with “Iron Fish” insert 5″x5,” also graphite on illustration board. I have sketched and illustrated several versions of this bridge and its “fish.” The Iron Fish sculptures are a pale green, mounted on concrete pedestals. The walkway is made of heavy timbers. This bridge is known locally as the Blue Bridge in Canal Park because, well, it’s blue. Local folks and tourists love it and the local government wants it replaced (to say they dislike it is understating it). It is aging and becoming unreliable and costly to maintain. I am enchanted with it on several levels. First, it has artistic charm, and then it has artistic un-necessary embellishments (the iron fish). It is cool to watch it open and close by going up in two halves. The bridge connects two sections of Canal Park that both have visit worthiness. It is functional and adds greatly to the ambiance of the area in which it “resides.” At night, which few stay around to see, it is a grand view of reflections of both light and buildings. Sometimes glassy reflections of returning small sailboats and fishing boats. This is where the harbor tours dock and depart, creating tens of thousands of bridge users to come and enjoy. This entry was posted in Drawing, Duluth Mn. 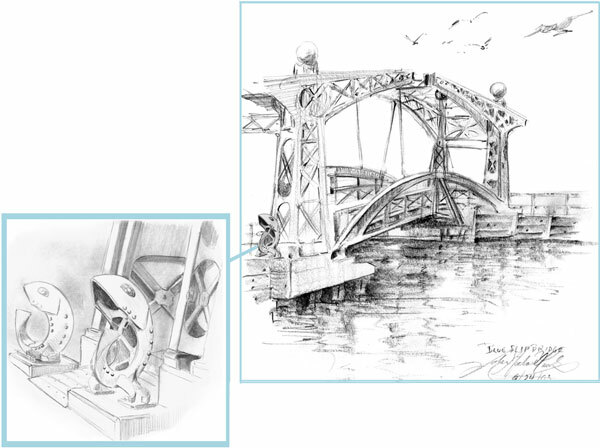 and tagged Blue walking bridge, bridge, Duluth Mn., fish, John Michael Cook, Lake walk, Original Minnesota art, Pencil on March 19, 2013 by eightdecades. Thank you, the bridge is a favorite of mine, one day soon I will paint it as well, or do a painting of it. I know it will be gorgeous!